Carlos Castenda believed that if you didn’t like your history or that it was holding you back then you should change it and make up one that would create the kind of person you want to be. This philosophy a been incorporated in San Miguel by Gangs as one of the requirements for Gang membership. Who doesn’t want to be in a gang made up of former chefs, artists and tycoons. “I was in retail” won’t get many people to join a gang but “I was a buyer” will. So the first step in joining a gang is figuring out who you use be. The following is the story of one successful gang member and who she became. Mary Thompson moved to San Miguel in 2001 from Fresno California, with her husband (whose name and story is irrelevant). Mary had worked in an insurance office completing forms. 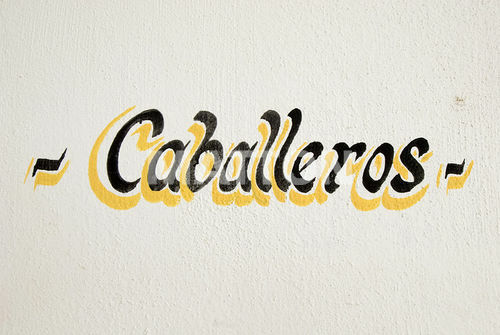 When she moved to San Miguel, finding a gang was difficult. Her uneventful life prevented her from joining the Spiritual Gang. So she took a few art courses and after a tumble from a hall rug, joined the Rug Gang. At her interview about her LBSMA (Life Before San Miguel) she was truthful and was told her past life wouldn’t do and to dig deep and make it more interesting. Her eureka moment came the next Friday when she was going through her recipe box. In her LBSMA, she had submitted a recipe for Tuna Casserole to her Church newsletter back home. “That makes me a reporter, she thought”. So she reinvented herself and started to write investigative REPORTS for Atención. Mary doesn’t like to report on anything unpleasant or Mexican. She is at every art opening with her notepad (that she made herself) and finds everything “Fabulous”. This is an exerpt from a Gang Manual to help people invent themselves. Use it to decode people’s history. How to find your past career. If you once made a tuna fish sandwich back home, then in SMA you were a souschef. If you once wrote something for your church bulletin back home, then in SMA you were a reporter. If you once used fresh thyme and/or rosemary back home, then in SMA you were a chef. If you have ever owned two houses (doesn’t have to be at the same time) back home, then in SMA you were a real estate mogul. If you ever once hand addressed Christmas card back home, then in SMA you were a calligrapher. If you ever once gave directions to someone on the street back home, then in SMA you were an air traffic controller. If you acted in any junior school play back home, then in SMA you were an actor. Every Gang member has a task once they buy their second home. Second homes are quite different than first homes because they must be named to distinguish them from first homes. Some call it by what it is e.g. the Cottage. I am going to The Cottage but the rules are different in foreign countries. 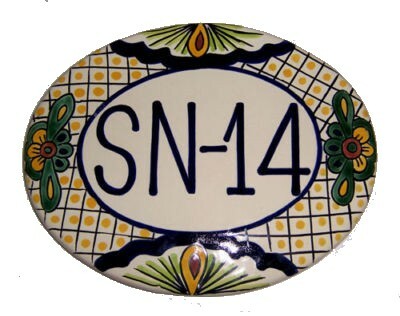 The house name has to be in the language of the country where it resides and written on a little plaque, It is believed that having a foreign name provides protection from vandals as they think it is a local house and it sounds so multilingual. Finding the right name takes time but in the meantime you can start plaquing by putting up this sign. Someone from the Translator Gang said it meant Welcome This House is Mine not Yours. The next step until the special name is found, is choosing a sign with numbers on it. Many Gang members are shocked and pleased to see signs in English for sale in Mexico such as this one. Looking for the right name takes time and care. 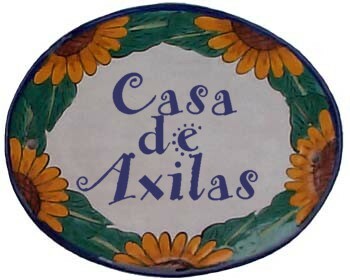 In choosing a house find a name that sounds romantic in Spanish. The worst naming technique is to use your last name. It makes your house sound like a bar. To avoid the last name ego thing, name your house after your favorite vegetable or fruit or bird. Another way is to think of a comfy word such as Nest. This method is good but the downside is that you end up with an English word that requires translation. 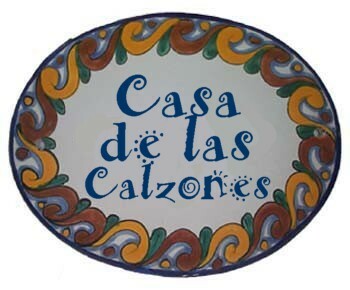 Once translated, a trip made to Dolores Hidalgo to get the plaque made in Talavera pottery all that is needed is to nail it to your house and now your Casa now has a name that people can read. But be very careful in choosing a translator. Foreigners find great delight in substituting swear words for common words and expressions when asked “How do you say?” Instead of translating “Please may I try on those pants” they will teach you “Please pull down my pants” and hope they are about when you try to use this expression. The owner of this house has yet to discover the downside of using someone wicked (armpits). And not all words translate easily. Some naive lady in Ajijic can’t understand why local snicker when they walk by her house and don’t understand her love of making Calzones (underpants). Another rule of house naming is to never say the name of your house into English even if you know the name. Once you say the word in English then the spell will be gone and it will sound a bit silly. Telling people you live in the Nest House or the House of Birds or the House of Pomegranates or the Little House of Songbird. Oh yes Joe and I live in the House of Small Parrots or the following. 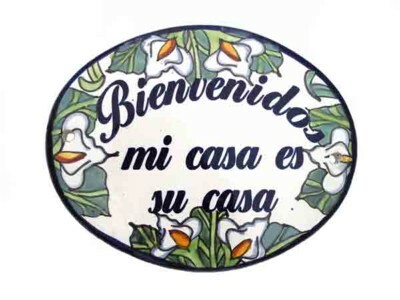 Most people won’t know you live in the House of Pancakes because they can’t speak Spanish or don’t own or know how to use a Spanish English Dictionary. Take me to Casa Agave. Oh it is by Casa Preciosa. But the real reason for a house name is to use it when you rent your Casa. 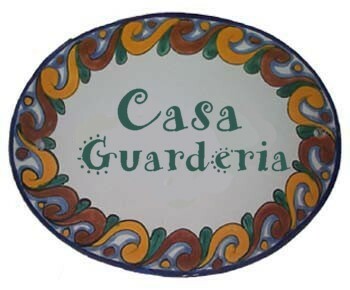 Imagine the delight your renter feels when they know they are renting Casa Bugamblia or Casa Latidah. Credit for the idea to Gina. Reinventing yourself is a long process. One slip of the tongue can undo months of careful life editing. The most dangerous area for slips of the tongue for new gang members is the World of Art. Philistines at heart, the transition to a life of living in an Artist’s Colony can be rough. While Gang members understand the role artists play in driving up house prices they really have difficulty understanding what they do. They know they have to Fill their Walls but the old “I know what I like” approach to art won’t work in an Artist’s Colony. 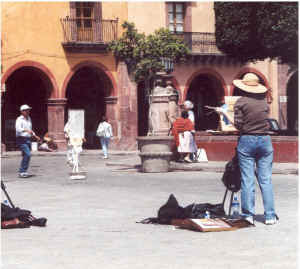 Many residents confuse artists with the homeless and often approach them with small donations. Some believe that the lady below has been hired by the city to create artistic feelings in the city. Creative-minded people enjoy a mix of influences. They want to hear different kinds of music and try different kinds of food. They want to meet and socialize with people unlike themselves, trade views and spar over issues. They favor active, participatory recreation over passive, institutionalized forms. They prefer indigenous street-level culture—a teeming blend of cafes, sidewalk musicians, and small galleries and bistros, where it is hard to draw the line between performers and spectators. They crave stimulation, not escape. They want to pack their time full of dense, high-quality, multidimensional experiences. Seldom has one of my subjects expressed a desire to get away from it all. They want to get into it all, and do it with eyes wide open. That statement terrifies new Gang Members. They come from a land without spice and controversy. They come from a land of Nice and Easy. And now they are require to try different food and eat on the street without air conditioning. They are required to have a point of view but have no news media to tell them what it is. It is so hard when you first arrive in San Miguel. 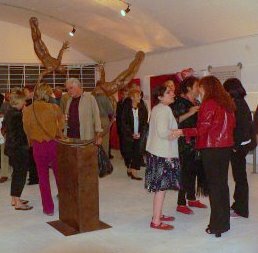 So the Gangs have a program called GFA – Getting Fully Arted offered evenings at the Biblioteca and other sites in the city to explain the mystical area of Art. Each gang member is given a sponsor to lead them through the stages of Getting Fully Arted. You can’t be Fully Arted unless you become a Bohemian. For some who were Hippies in the 1960’s this is not that difficult but people from Texas need lots of training. You start your transition to Bohemian with clothing. You are what you wear. A rug over the shoulder says Bohemian while a backpack suggests poverty or high school. Carrying a bag with Friedo Kahlo’s picture says Bohemian while carrying a Louis Vuitton bag suggests Bourgeois. Combat Cocktail Sandals says Bohemian while wearing running shoes suggests the Wrong Side of the Tracks. Gang dress codes simplify this immensely. Once you look Bohemian then you can start to climb your way up the Art Ladder. Learning to climb the Art Ladder comes from completing two Courses in Getting Fully Arted – Watching Art and Making Art. There are many rungs on the the Art Ladder. Watching Art has six levels. The first and easiest level the Art Gallery Opening. Gang members put on their new Bohemian clothes and with their sponsor enter the Gallery. They are allowed only to say “Ummm” or “Interesting” or “Good use of Color”. They are only allowed five minutes at their first opening. At their second opening they can purchase something small. Gangs must attend one art opening a month and have Gallery Opening Cards that must be completed each month to prove their devotion to watching Art. When they have four stamps they can move on to the next level. Level Two is Watching Music. This one is a piece of cake as all you have to do listen. Every gang member must start at Bella Italia and hear Doc Severinsen. It is a right of passage in San Miguel to hear Doc who lives in San Miguel. Once you have heard him and the guys who play with him then you can recommend this show to everyone. 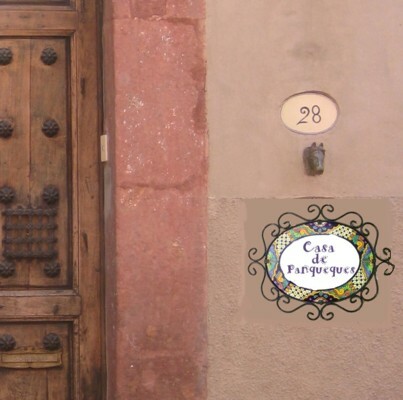 You have become an tour guide and an expert on music in San Miguel. Each concert is recorded on the Music Appreciation Card and after four concerts you can move on. Opera and classical music are to be avoided at all cost. This type of music required special training beyond the ability of most philistines in San Miguel. The Third Level is watching Film. Level Four is watching plays. Watching plays is a lot harder than watching movies because of the dreaded intermission where you can get caught off guard when someone asks “So how do you like it so far.” For most people in San Miguel that answer is “Great”. As a rule of thumb all art in San Miguel is great. There is no such thing as bad art. However there a few people who will use this question to test you. These are the critics who are in reality Artistes. An Artiste is dangerous because they believe they have evolved from being a Gang Member to a fully actualized individual with opinions that matter. They like nothing better than to test new Gang members to find badly contructed lives. An Artiste however, might simply be a Tourist who knows good art from bad art. These people are gold and actually may give opinions that you can later claim as your own. A tourist is easy to spot as they aren’t dressed like Bohemians. When gang members move to this level, the world gets dangerous. To most gang members, dancers are just people running about on the stage wearing scarves. To pay money for it seems a crime. So to avoid riots in the theatre, new gang members are instructed to only go to Musicals where there is singing and dancing and songs they know. This is a great activity for people who don’t like to read. Someone will read to you for a fee. But it is a rather complex activity because it requires making some choices. Genre is new word at this level. You are told to find a genre you like. Some members confuse gender and genre. Once you have a Genre then you only attend readings and listen. You are not allowed to speak or write. Gangs recognize that part of the psyche of individuals who uproot themselves to a foreign land is the craving for safe yet interesting foreign experiences. These experiences form the basis of the repetoire of stories that are told in the Jardin or Back Home. The Gangs in San Miguel, therefore, have a requirement that each gang member must make at least one Mexican Friend so they can begin to build their Repetoire of Stories. There is a relationship between the amount of Stories you have and how immersed you have become in your adopted land. Gang members are instructed to befriend their maid and gardener first and to refer to them using the term Mexican Friend . A typical sentence would be “Oh but my Mexican Friend Maria told me yesterday.” The term Mexican Friend is like Don and Dona in Spanish or Mr., Mrs., and Ms. in English but genderless. These Mexican Friends are now the proof to those back home that you are living in a foreign country and have changed. Payback from having Mexican Friends is almost immediate with the first invitation to the maid’s brother-in-law’s kid’s baptism, or the gardener’s granddaughter’s baby shower. Attending with an expensive gift, will results in the building of the Repertoire of Stories. Non gang members in the Jardin with no Mexican Friends are in awe of anyone who “Really knows about this place”. A touching payback comes when your Mexican Friend or neighbor (referred to as My Mexican Neighbors or My Poor Mexican Neighbours) knocks at your door with gift of a plate of tortillas. Now the routine for friendly exchanges has begun and you will reciprocate with an small appliance or lawn furniture bought at Costco. The ultimate payback comes when you are being asked to be madrino or padrino by your new Mexican Friends that you have only known for 5 days. Now you are part of their family and near the top of the ladder of those who have become part of the community. Making friends is a win win situation for all. For Mexicans a small investment such as a plate of tortillas or asking them to be a madrino or padrino leads to overgifting and $. For the expat a gift leads to a Mexican Friend and the start of a vast repertoire of stories about them. Everyone wins. Thanks to Jennifer Rose for the concept and details on this Gang Activity that seems to exist outside of San Miguel too. San Miguel would be truly Heaven if everyone spoke English. Then it would be like living in the US or Canada but on cobblestone streets and having help. Gangs understand the frustration faced by new members who can’t be understood but tell them soon Gangs members will outnumber the Mexicans in town in five years and be able force them to take speak English. In the meantime some members of the Doing Good Works Gang are doing their part to make San Miguel uni lingual by teaching locals how to speak English. As a gap to bridge the time until English is the official language of San Miguel Gang members receive a small manual of Spanish expressions to guide them in San Miguel. It is produced in its entirety below. Gracias – means thank you. When ever someone says something to you in Spanish simply smile and reply Gracias and quickly walk away. Si and No – Si is Yes and No is No. Depending on your mood that day, you can go through most of your day responding Si or No to anything asked you in Spanish but remember to say Gracias before you walk away. Cuanto Cuesta plus a hand held calculator – When you find stuff you want to buy, say Cuanto cuesta and hand them your calculator. They will type in a number indicating the price of the item. But remember prices aren’t fixed in San MIguel (except for Art and Warren Hardy Language Classes) so be prepared to spend at least two more hours passing the calculator back and forth until you get that “Special Price”. Banos – means toilets. If nature calls simply say the word banos and have a pained look on your face. Failing that go into any expensive hotel where the restrooms say Men and Women. However if the doors don’t have pictures of men and women on them but only Spanish words then I you are in for an adventure. M sometimes is where women go. But as many a gang mama has found, in San Miguel, using the wrong washroom can work to your advantage. If you are a cowboy then use this sign to guide you to cowboy things. Finger Pointing – Just point at what you want and use your fingers or hand held calculator to tell them how many. What to do if a Restaurant doesn’t have an English menu. This is a sign that tells you that the food won’t be like home so leave quickly but don’t forget to say in a loud voice as you go out the door “They aren’t going to get much business with that attitude.” Just so they know who runs San Miguel. All staff in Art galleries speak English. So if you need something, pop into a gallery, look at few pictures and say “Interesting” and then ask the staff about how you could get what you need. Everyone in the Jardin speaks English so they can guide you to whatever you want to buy. Go the Biblioteca. They have a program that matches you to a Spanish speaker who wants to speak English. Once matched then voila you have your own San Miguel Guide. They work for nothing and all you have to give them is a few expression in English. We laughed our asses off, especially re: naming houses. Thank you for that. Would love to join this crazy group. Moving to San Miguel 6/1/2013. Details and thanks! What a hilarious blog. Loved it. Especially living in centro and reinventing your life. Have visited sma many times and love the mix of weather, culture and small town charm. But is life there really that pretentious? Currently living in cuentas Ecuador but the weather is just not to my liking. Was thinking about SMA but now that I fit the stereotype of a “gang members” like a glove not sure. Where do single woman who really are artists go to warm there weary Canadian bones? Si solo supieran lo que dicen esos “amigos Mexicanos” FUNNY! re-invent yourself buy our house. http://www.villacontenta.com for sale now!!!! I can’t believe it took a tourist to tell me about this blog, I love it. Been here for 23 years and can’t figure what gang I belong to. Maybe I am gangless. :-(. Not finding a share button so I can post to my Facebook gang. Regarding Mexican Friends, perhaps someone should start a “Mexican Friends Store.” Then gang members could rent a Mexican friend or perhaps even a whole family without the bother of actually getting to know them. Think of the time saved! Many years ago, in Cabo San Lucas, when Gringos had to have a Mexican partner to start businesses, there was a frantic rush for any Mexican who would be their business partner. Taxi drivers and hotel managers were very much in demand as they spoke at least a little English and that qualified them as a viable business partner. I’m in the-gonna come back and read this some more-gang! I guess yuall think it’s cute to write at the expense of your “mexican friends”. Be your patient selves and maybe in your next generation yuall will also take over THAT mexico and all the people there will be ordered to speak English. We’re in Merida and I write a Merida website. The similarities between the two towns are uncanny, shall we say, except SMA probably wins in the “precious” department. 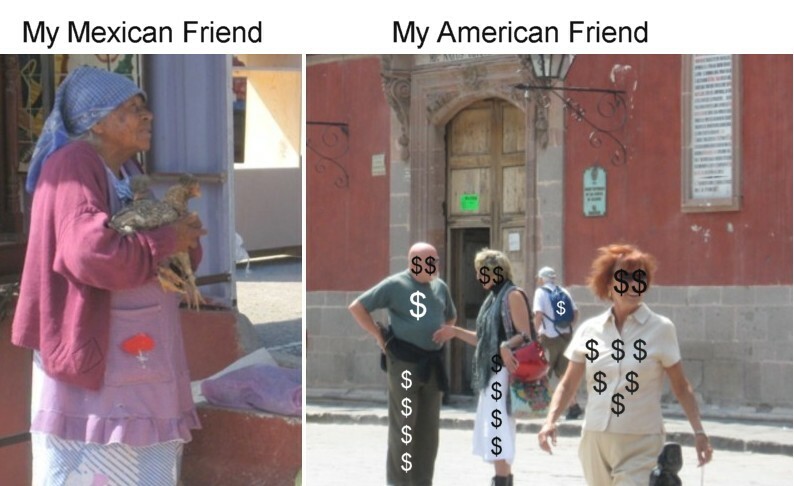 I particularly loved your piece on Mexican Friends. Too funny. Maybe it’s like this in all ex-pat communities. What do you think? I have been ‘considering’ moving to SMA and, now, after reading your blog, it’s definite. How could I go wrong. Thank you for pushing me over the edge. See you in September! this is wonderful, you have made me laugh out loud several times. I just had to email my friend in San Miguel to tell him about the site and my new fears of the gangs as we are coming to San Miguel de Allende on his recommendation. “you will like Richard, he is very funny” I already do. Looking forward to meeting you Ted Johnson’s friend and fellow Riverdale (past tense) resident. Oh my God!!!!! You really are too good. You have pegged SMA perfectly. I love living here because of all the characters, some misfits and the occasional crazy. We all fit into a category somewhere and it feels good to laugh at ourselves. So far I have been lucky and haven`t seen my picture here. I love this site! So funny! Dr. Beverly Nelson of Lifepaths Retreats in SMdA is my mentor. What a life in San Miguel!